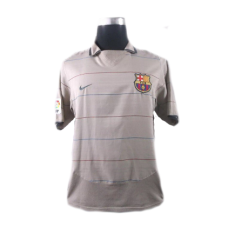 This Ronaldinho Barcelona Shirt Away 2004-2005 is an original classic football shirt. Ronaldinho won his first league title in 2004–05, and was named FIFA World Player of the Year on 20 December 2004. His fame was growing with his entertaining and productive play in both the La Liga and the UEFA Champions League. On 8 March 2005, Barcelona were eliminated from the latter competition by Chelsea in the first knockout round, losing 5–4 over two legs. 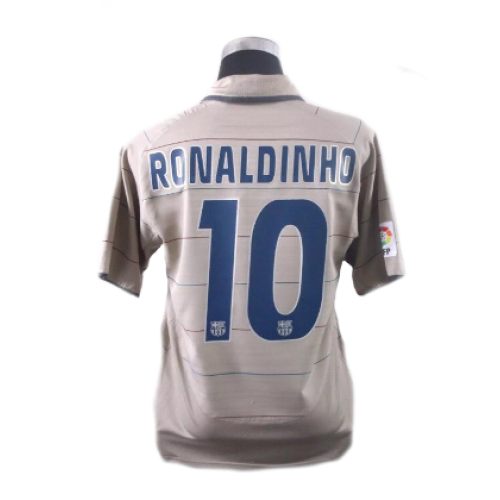 Ronaldinho scored both goals in the 4–2 second leg loss in London, the second a spectacular strike where he feinted to shoot before striking the ball with no back-lift past Chelsea goalkeeper Petr Čech from 20 yards out.